Though I couldn't taste it, I'm sure it tasted great as I trust her judgement. Anyway, here is my "Rye, cider and oat bread" packed with flavour. I really enjoyed the nuttiness of rye, subtle sweetness of treacle and fruity flavour of cider. The crust gives a distinctive character to this bread. This is a perfect loaf for a ploughman's lunch of chutney, apple and celery slices, and your favourite cheese. 1. Mix the flour, salt and yeast in a bowl. Add the treacle, 100ml (3½fl oz) of the water and 150ml (5fl oz) of the cider. Using your hands, stir the ingredients together until all the flour leaves the side of the bowl. Gradually add the remaining cider and water if needed (I only added 20ml of water and 70ml of cider)- the dough should be soft and all the sides of the bowl should be clean. 2. Tip the dough onto a lightly floured surface and knead for 5-10 minutes. The dough will be wet initially but will become smooth once worked. When the dough has a smooth skin put it into a lightly oiled bowl. Cover with a clean cloth and leave for two hours. 3. For the topping, mix the cider with the rye flour and a pinch of sugar to form a thick batter. 4. Tip the dough out onto a floured surface and shape into a ball. Spread the cider paste over the loaf and sprinkle over the jumbo oats. Place the loaf onto a baking tray lined with parchment. Leave to prove for one and a half hours. 5. Preheat the oven to 220C (425F / Gas 7). 6. Bake for 25 minutes. Reduce the oven temperature to 200C (400F / Gas 6) and bake for a further 10 minutes. The loaf will be golden-brown and should sound hollow when tapped on the base. Leave to cool on a wire rack. As I mentioned in my previous post about "Overnight Sponge and Dough Method Bread", I changed the ratio of flour and water here. The new formula is much easier to handle than the previous one. Lightly flour the work surface and knead the dough for 10 minutes, then cover and leave in a warm place until the dough has doubled in height (2-3 hours). Mould the dough into rugby ball shapes and place them on a baking tray. Cover with a clean tea towel and leave to prove (30 mins - 1 hour). Dust the top of the loaf with a little more flour and slash the top with a sharp knife if you want. I really enjoyed my bargain lemons and there were the last two remaining in the fruit bowl. I was wondering if there was any unusual recipe for my last two lemons and came across something called "lemon bars." Sounds very American to me as we may call these "lemon slices" here in Britain. Anyway, these are slices of very tangy lemon filling on top of a biscuit base. That's more or less what they are. Tray-baked lemon tart ... something like that. I added lemon zest to the filling to get even more lemony flavour. Click here for the video for how to make these. In a medium bowl, blend together softened butter, 250g flour and 100g sugar. Press into the bottom of a 9x13 inch pan. Bake for 15 to 20 minutes in a preheated oven, or until firm and golden. In another bowl, whisk together the remaining 300g sugar and 30g flour. Whisk in the eggs, lemon zest and lemon juice. Pour over the baked crust. Cut into squares when cooled. I can't resist a bargain .... A bag of unwaxed lemons was half price ... I had to buy them. 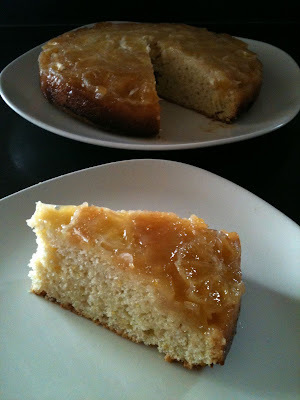 So here is the incredibly tangy upside-down lemon cake with two whole lemons. Yes, truly two whole lemons. I used lemon zest in the cake mixture and sliced the lemons and placed them in the bottom of the cake tin which was layered with caramel sauce. I love lemon, but it was seriously tangy. However, somehow, it was quite morish and I really enjoyed it. Should I recommend you to bake it? I'm not so sure ... but if you REALLY like a tangy lemony flavour, go for it. Place the granulated sugar and 6 Tbsp water into a stainless steel pan. Boil until a golden straw colour and immediately pour into the cake tin. Leave it to cool. 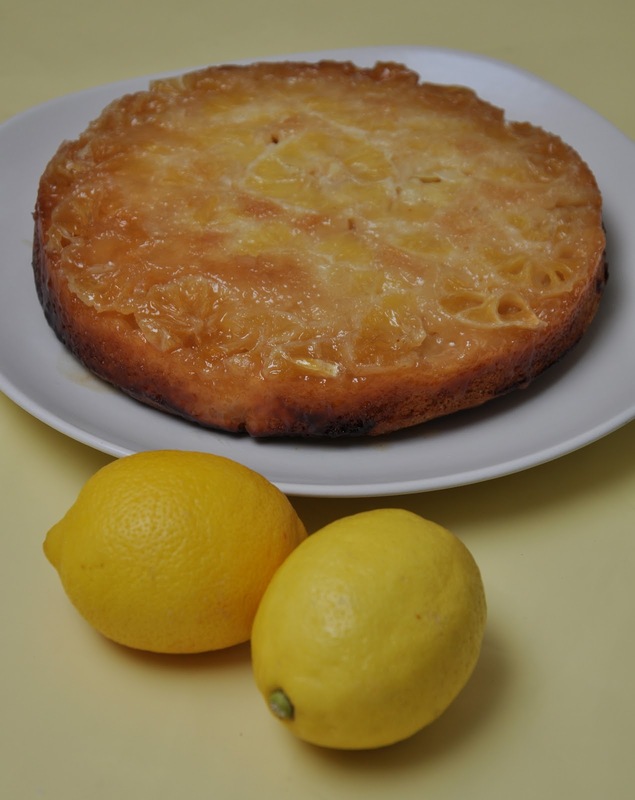 Slice the lemons and place them on top of the caramel layer in the bottom of the cake tin. Measure out the dry ingredients in a large mixing bowl. Add lemon zest. Add the wet mixture into the dry mixture. Stir until just combined. Bake in a preheated (180 C) oven for 20 minutes or until golden brown on top. When the cake is baked, leave it for a few minutes then turn it upside-down onto the plate.